Hunger Free Vermont has issued this information. If you are applying or recertifying, documentation has to be in by Jan. 15 in order to get February benefits. Because of the government shutdown, Vermont’s Department for Children and Families (DCF) will be issuing February 3SquaresVT benefits early, on January 20th. These benefits will be for the entire month of February, so it is important that participants budget accordingly. The public is welcome to attend a public hearing on Wednesday, December 19th at 6 pm, and offer feedback regarding the final draft of the 2018 Telecommunications Plan. In accordance with 30 V.S.A. 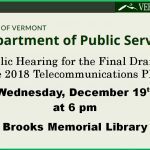 § 202d, the Department of Public Service is tasked with drafting a Ten-Year Telecommunication Plan for Vermont, in coordination with the Agency of Commerce and Community Development, the Department of Health, the Department of Public Safety, and the Department of Education. Four Vermont towns – Royalton, Sharon, Strafford, and Tunbridge – have been placed on the latest list of endangered historic places. “America’s 11 Most Endangered Historic Places is an annual list that spotlights important examples of our nation’s architectural and cultural heritage that are at risk of destruction or irreparable damage” says their announcement. Route 66, Mount Vernon, and other sites are on the list. As of this writing, James Ehlers, Christine Hallquist, Brenda Siegel and Ethan Sonneborn * have all agreed to attend a Candidates’ Forum at the Gibson-Aiken Center, Senior Meals, on Friday, July 6th at 8:00am (as always, “doors open” at 7:30am for informal networking). 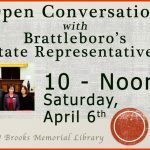 11 APRIL 2018 – Montpelier, Vt. – Governor Phil Scott today signed bills S.221, H.422 and S.55, relating to violence reduction and gun safety. Below is a transcript of his address. Governor Scott: On February 16, I was in my office preparing for the day ahead, when everything changed. That morning, I was handed a document containing charges against an 18-year-old, outlining his detailed plan to carry out a school shooting here in Vermont. As his campaign page says “I’m 13 and running for Governor of Vermont. I believe in protecting our future for young people. That’s why I’m shaking up Vermont politics. His issues? Universal healthcare, education, youth engagement, a worker’s bill of rights, raising the minimum wage, LGBT rights, energy and the environment. On Tuesday, January 23, 2018, Governor Phil Scott presented his budget proposal to Vermont’s General Assembly. Read the full text of his address below. Vermont has just become the first state to eliminate penalties for possession of limited amounts of marijuana by adults. Governor Phil Scott signed H. 511 today. Governor Phil Scott Desperately Searching For Excuse To NOT Sign New Marijuana Legalization Bill! Vermont Governor Phil Scott is still desperately searching for an excuse to NOT sign the new marijuana legalization Bill in Vermont. Vermont Governor Phil Scott Has 5 Days From Jan. 10, 2018 To Sign the New Marijuana Bill – Will He Do It? 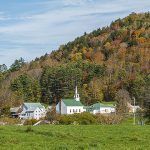 Vermont Governor Phil Scott has 5 days, from Jan. 10, 2018, to sign the new Marijuana Bill – will he do it? January 4, 2018 Vermont House Votes to Legalize Marijuana After Threat by US Attorney General Sessions! One of the topics covered by Senate Government Operations is public safety. As Chair of that committee I realize that over the past years, many studies have been done concerning law enforcement/public safety in the State of Vermont. A few of the recommendations have been implemented but the more controversial aspects of each study have gone untouched because many would be unpopular with various segments of both the population and law enforcement agencies.